At some point in the next couple of years I became aware that Stritch is, in fact, a legendary stage actress, arguably best known for originating a role in Company by Stephen Sondheim but boasting many other accomplishments. As a theatre professional I recall noticing that her most recent Broadway appearance, starring in A Little Night Music with Bernadette Peters, was perhaps more successful than the original revival marquee pairing of Catherine Zeta – Jones and Angela Lansbury. 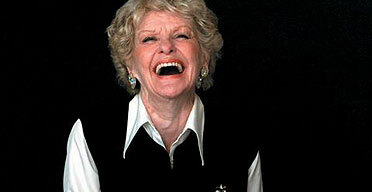 And so the documentary film Elaine Stritch: Shoot Me is making the rounds at cinemas around the country. I first heard about this film well over a year ago and found the actual experience of seeing it to be somewhat anticlimactic for that reason. I also may have been feeling some residual annoyance that I did not attend its Michigan premiere over in Birmingham last month, for which Ms. Stritch was also in attendance. The film takes an unflinching look at Stritch’s life circa 2011 – 2012, as she continues to perform mostly in cabaret settings, struggles with problems related to the aging process, begins to tire of life in Manhattan and (somehow) maintains a resiliency that “the show must go on” – to use a cliched but true phrase. Stritch demonstrates resiliency, commitment and salty enthusiasm in all of her projects, perhaps most notably in her balance of masking her difficulty in memory into a sort of comedic act with her musical director when they are performing… to the audience’s delight. I found the scenes where Stritch was at her most genuine to be the most appealing. These moments took the form of when she was with family members or close friends. There she was as a veteran and accomplished performer earning her accolades but also going with the flow and not getting too worked up about something not going right, a deadline or an impending decision that had to be made. It seemed those moments, with her broad and genuine smile and satisfaction, showed her at her most honest. Ms. Stritch has been vocal about a seemingly and understandably rough transition into her life in Birmingham, but based on recent interviews it appears that things have settled down for her a bit more now, and I do hope that she’ll make a few more appearances in the metro Detroit area, which seems very honored to count her as a regional native. Posted on May 7, 2014, in Movies, Theatre and tagged documentary, elaine stritch, michigan, movies, performance, performers, showtunes, theatre. Bookmark the permalink. Leave a comment.